In San Luis Obispo we have wonderful diversity of home styles, amenities and locations. You have the luxury of living on top of a mountain, the vast beauty of a low lying valley over looking vineyards or the privilege of living at or by the ocean. Our county offers a vast array of home buying possibilities to new and Moving-On-Up buyers. Are you a Move-up buyer? If you started out owning a 2 bedroom condo and now have the ability to purchase a larger home, you have the potential of being a move-up buyer. The definition is someone who owns a house, but wants to move into a bigger and better property. The Move-up is about growing your home buying expectations and taking a step up in home ownership. One of the biggest benefits is low San Luis home prices. With interest rates and home prices being depressed the opportunity to buy more home for your dollar is a reality. All of this is relative. The facts are the house you are selling is not worth what it was at the peak of the market, but neither is that house you want to move up into. With the depressed costs for homes, you have the opportunity to buy more house now and reap the benefits of growing equity and your property value going up with time. A win win situation! So lets see if this is a good time to take advantage of the buying opportunities and if selling now and moving up might not be a bad idea to take advantage of. As a first time home buyer you bought "Home-A" at the peak of the market it would have cost you $300K. 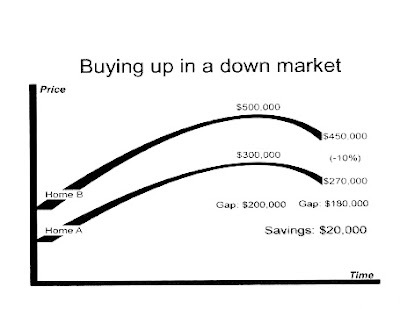 If you were a move-up buyer and bought "Home-B" at the peak of the market it would have cost you $500K. The gap between the two prices is $200K. But if you bought "Home-A" at the down turn of the market it would cost you $270K and the cost for "Home-B" at the down turn of the market would have cost you $450K. The gap between the prices is $180K, a savings of $20K between buying at the peak of the market vs. the current downturn of the San Luis Obispo market. So in this scenario you are getting more home for less money. This is the basic premise to why if you can "Move On Up" and buy a bigger home, now is the perfect time to do it. When prices are still low and Interest rates are under 6%. I Just Got Audited in San Luis Obispo! 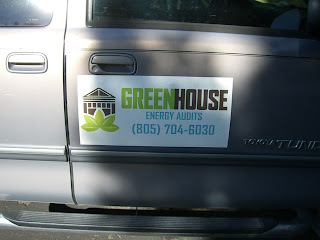 Today our home got a Whole House Energy Audit. Thank you Try Spindler and Paul Manconi from Central Coast Green House who came to give us a free Home Energy Audit, paid for through PG&E. 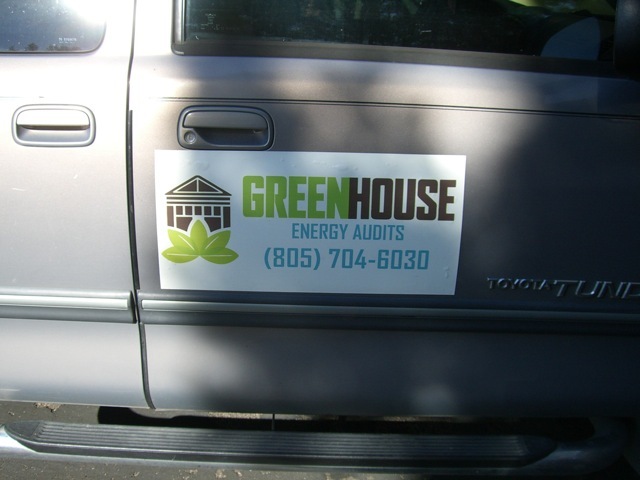 Our local non profit Sustainable organization, SLO Green Build, has set up this great offer to home owners to give free energy audits to show home owners where they can save money on their Heating, Cooling and Water usage. This is essential to saving monthly on your utility bills. The process involves numerous steps and took about 4 hours total. A Blower Door fan was installed on the front door to negatively pressurize the home to test where air was leaking from. The biggest air leakers are windows, vents and air ducts. Even our light switches were leaking air. It's Crazy! This Photo is of our ceiling vent. 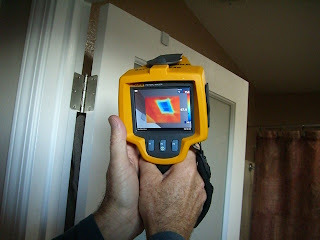 The thermal photo imagery shows that the vent is leaking cold air from the attic into the home and is wasting energy. Bad vent...bad! Jamie Hendrickson from the local Mutual Water company came by to check for leaks in our toilets and the Gallons of water we use on average. 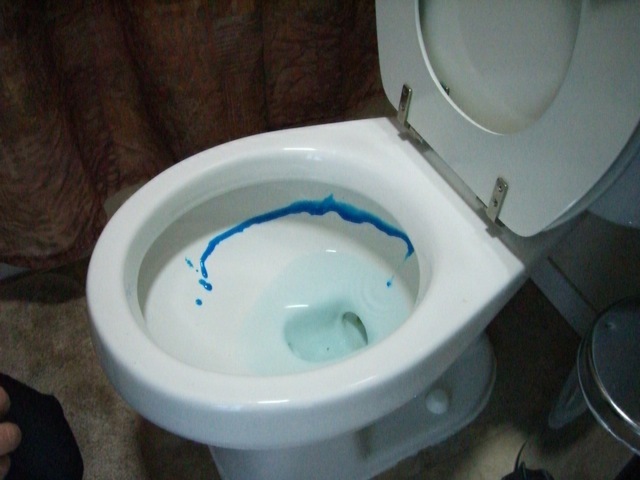 The blue dye was put on the bowl to see if any water was leaking from under the lip of the bowl. She called it a "silent leak" that can cost you numerous dollars a year in added water costs. Next week we will be getting the results of all of the testing to see how our home stacks up. They will also tell us where and how to improve the Energy Efficiency in our home and save on our Utility bills. 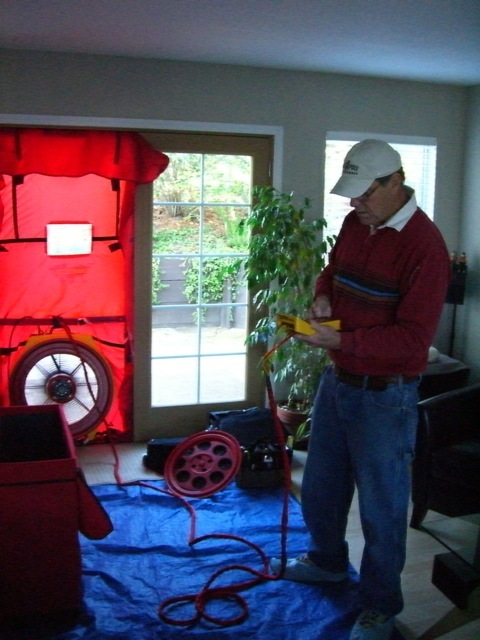 To learn how you can get a free Energy Audit done on your home talk to your local green/ sustainable organizations or your Gas & Electric Companies. There are state and government incentives available to home owners. Or call your local Energy Auditors, they are about $450 for your home evaluation and well worth every penny. 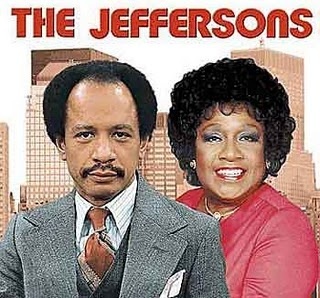 Heck, they may save you that much in utility bills. 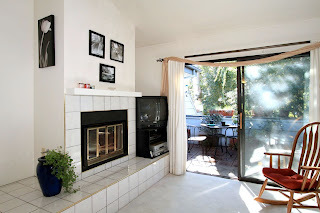 San Luis Obispo Condo for Sale! Calling All Cal Poly Parents... This Condo on Exposition Drive is the perfect investment property for your Cal Poly incoming student or for you first time home buyers. This clean end unit in the Convenient Woodbridge Condo Complex. 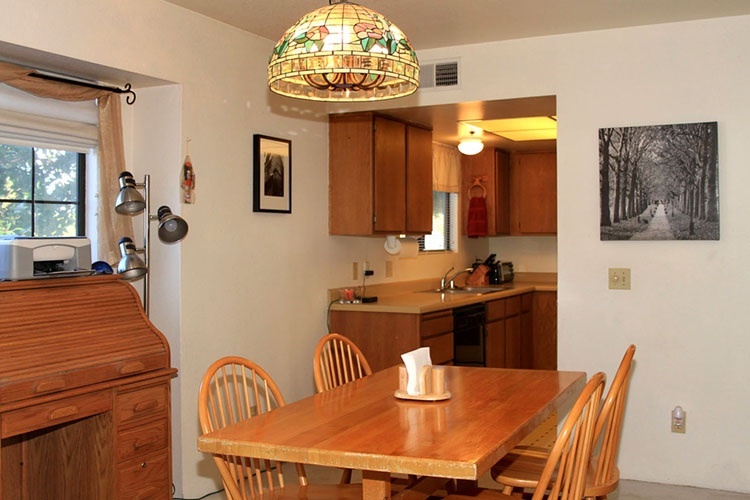 It's a 2 bedroom 1-1/2 bath with just over 1,000sq.ft. It has a tiled living room fireplace with newer clean carpet throughout. This unit has additional windows as an end unit and is very private, with only one neighboring unit. Backyard Deck has a small exterior storage unit. The refrigerator, washer and dryer and water softener is included in the sale of the property. The unit has a single Car Garage and one designated parking space. This condo would make a great investment property or first home. 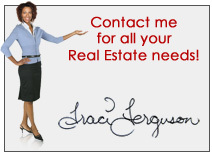 Click on condo to see the official website or give me a call or email Traci today to see this beautiful home. I have a listing in Grover Beach that is a great opportunity for any investor in San Luis Obispo. Contemporary Grover Beach Tri-Plex! Units are 2-Bed, 1-Bath w/ 2car Garage. Each unit is separate from another, no adjoining walls. Units have high clear story windows with tons of natural light & generous living rooms. Live in one and rent out the other 2-units. Very strong rental area & below market rental rates. Coin-op laundry on-site. Seller also ownes the Tri-Plex next door and is also available for purchase. A current expense report is available on request. Seller intends on doing a 1031 exchange. To see more photos click Tri-Plex. Or if you would like an expense report email Traci.